Pawniard in game: 6,518 Who? Important notice! Pokemon Pawniard is a fictional character of humans. Pawniard (Japanese: ???? Komatana) is a dual-type Dark/Steel Pokémon introduced in Generation V.
Pawniard is a small, bipedal Pokémon. It has a rounded red and black head with a silvery blade extending from the front. Its face is grey with yellow eyes. Four steel spikes protrude from its black torso, two on each side connected by steel ribs. 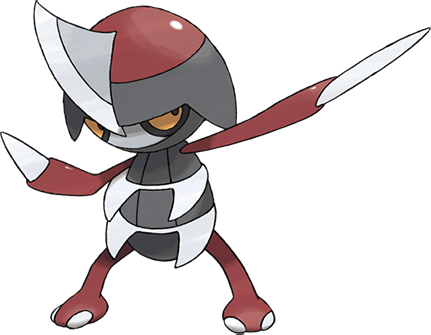 Its red arms that end with knife-like blades instead of hands. When hunting, Pawniard immobilizes prey by repeated stabbing with these blades. Its legs are red with two-toed feet. 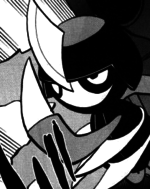 In the wild, Pawniard lives in packs governed by Bisharp. Pawniard debuted in the anime in Cilan Versus Trip, Ash Versus Georgia! under the ownership of Georgia. She was put up against Ash's Snivy in the second round of the Club Battle tournament. A Pawniard appears alongside its Trainer in a brief flashback in There's a New Gym Leader in Town!. In the Black 2 & White 2 chapter, Pawniard starred in a Pokéstar Studios movie featuring Brycen-Man; it was easily defeated by Whitley's Foongy. Komatana may be a combination of ? koma (a piece in the board game Shogi), ??? komagire (small pieces), and ? katana (sword) or ?? kogatana (knife).